Because I’m always looking for an excuse to buy a new radio, I’ve been looking at the various VHF-and-up digital modes in use on the ham band. There are a multitude of them in use. The other thing I think DMR has going for it is that it’s an open standard (ETSI) with a lot of commercial gear from a number of manufacturers. That serves to drive down cost a bit. DMR isn’t entirely unique here, but it seems to be the cheapest path. 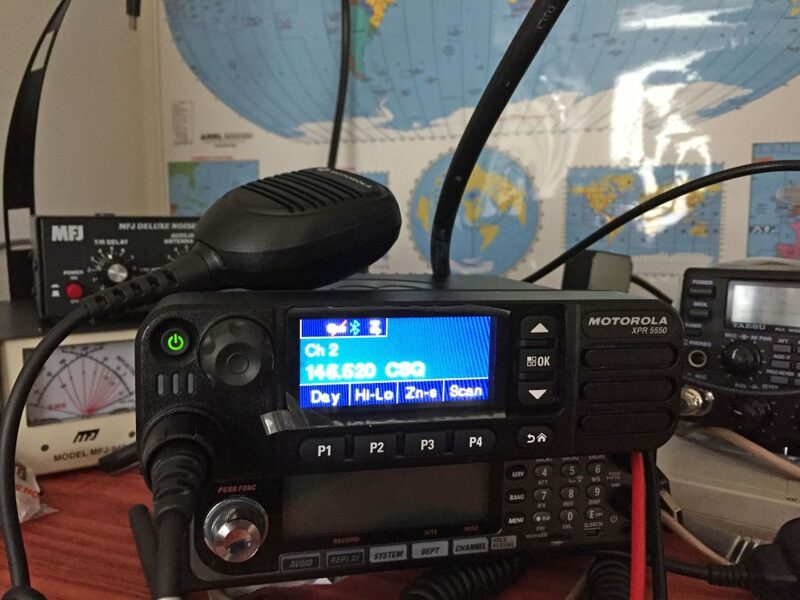 As with some of the other digital modes, DMR supports things like one-to-one calls (though the operators of the networked ham repeaters ask that it not be used there) and sending of text messages / data. It’s a Motorola XPR 5550, VHF. Interestingly, it also has a dedicated GPS receiver built in. I’m now onto my next challenge: obtaining the programming software (CPS) for the thing. Because it’s a commercial radio versus something targeted at hams, it’s not easily programmed. (FCC Part 90 regulations intentional forbid allowing users to enter their own frequencies, for example, since in many cases that would wreak havoc.) For some reason, Motorola insists on selling the software through Motorola Online (MOL), which requires that you request an account and wait days for it to be manually provisioned. They also, frustratingly, charge close to $300 for it. The software is floating out there for illicit download, but I want to do this right. Also, this being a newer commercial rig, it only supports “narrowband” 12.5 kHz channel spacing out of the box. Ham radio has not narrowbanded, so this is undesirable. Motorola offers a free “entitlement” to enable legacy 25 kHz channel spacing, but getting it apparently requires an active CPS subscription. So for now, this really slick digital radio sits on my desk, monitoring the pre-programmed 146.52 2-meter calling frequency, in analog FM. I can’t wait to get this to do a bit more!